In May of seventeen eighty-seven, a group of America's early leaders met in Philadelphia. 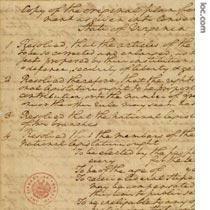 They planned to make changes in the Articles of Confederation. Those articles provided for a loose union of the thirteen states. Instead of changes, however, the leaders wrote a new document. It established America's system of government and guaranteed the rights of its citizens. It is still the law of the land. The thirty-three-year-old governor of Virginia, Edmund Randolph, presented the plan. 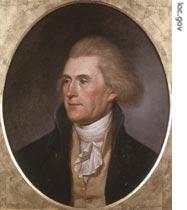 First, he spoke about America's existing plan of government, the Articles of Confederation. Governor Randolph praised the Articles and the men who wrote them. He called those men "wise" and "great." But, he said, the articles were written for thirteen states in a time of war. Something more was needed now for the new nation. Something permanent. Join us again next week for THE MAKING OF A NATION – an American history series in VOA Special English, on radio or online. I'm Shep O'Neal with Blake Lanum. Transcripts and MP3s of our programs are at www.unsv.com. 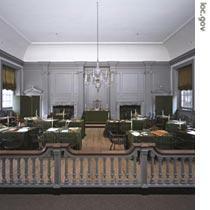 Many delegates had a meeting in Philadelphia. They planed to make some changes in the Articles of Confedertion,but in the end it established American' system. During a long time' debated they aslo writered a new constitution. Great, wise man who builded one nation. I think that it is same for every conturies among the world. Think of the time then, how difficult it is, how lucky we are! And hope people who are forced by war now would get a live peacefully as early as possible. for a few moments,there was complete silence. People have the right to speak and press, but in order to fight for them these delegates first dismissed outsiders' those rights. For the sake of talking freely, they agreed to use a simple mechod of committees.